The 140th anniversary of the Oahe Chapel north of Pierre will be celebrated on Sunday, Sept. 24. The festivities begin at noon CDT with an ecumenical, commemorative church service led by Pastor Emily Munger from the First Congregational United Church of Christ. The service will be followed by a free luncheon and lawn games. Freewill donations to support the continued maintenance of the chapel will be accepted throughout the afternoon. The chapel, first opened in 1877, is located adjacent to the U.S. Army Corps of Engineers Visitor Center, approximately six miles north of Pierre on SD Highway 1804. “Board members of the Oahe Chapel Preservation Society hope to host many people on Sept. 24 as we celebrate the history of this historic chapel,” said Kate Nelson, society vice president. That history of the Oahe Chapel began in 1872, when a mission was established by Thomas Lawrence Riggs, a Congregational minister, and his younger brother Henry, to serve the Sioux Indians of central South Dakota. Originally known as Hope Station, it was located on the west bank of the Missouri River across from Fort Sully. The Riggs family moved across the river in 1874, after a small log house on Peoria Bottom, currently known as Peoria Flats, was enlarged to three rooms. This became the main mission station, known as Bogue Station. It was located roughly five miles upriver from the chapel’s present location. Peoria Bottom had long been a gathering point for American Indian families. At that time, about 300 families from the Two Kettle and No Bows bands lived there. Many years before white men arrived, an Arikara (Ah rick ah rah) village with a large council lodge stood on the site, which became known as Ti Tanka Ohe (tee tonka oh-hay, meaning large house site). The name Oahe, derived from Ohe, in this form signifies “foundation.” The mission was renamed the Oahe Mission in 1883 when a post office was established. Thomas and his first wife, Cornelia Margaret “Nina” Foster, operated the mission. The log house was the center of activities, including instruction in Christian principles, homemaking and learning to read and write in Dakota. Rev. Stephen Riggs, Thomas’ father, had learned the Dakota language while working with the Sioux in Minnesota in 1837. He and Thomas Williamson then created a written Dakota alphabet and translated the Bible into Dakota. When the home became too small, money was raised for the construction of a chapel. Funding started with 14 cents sent by Nina’s six-year-old nephew. Other donations came from Nina’s home church in Bangor, Maine, the American Board of Foreign Missions and the Dakota tribes. The cost of the new chapel came to $1,400. In 1877 Thomas traveled to Sioux City, Iowa, to purchase the lumber. It was shipped upriver by the steamboat “Durfee” in June and unloaded one-half mile from the chapel’s site. A carpenter was hired in Sioux City, but the rest of the labor was done by Thomas and the people the mission served. The first service was held in the unfinished interior of the chapel in September of the same year. The chapel was used not only for worship and school. A carpenter’s workbench was also in the building. In the evenings, 25-30 American Indian men came to use the workbench and also to learn reading skills. All students, including men and women, began with an ABC primer before moving on to learn to read the Bible, first in the Dakota language and later in English. Nina died in August of 1878. The Bangor Congregational Church gave several gifts in her memory, including a pulpit built with her name carved on the front, a flower stand and the bell. The bell is inscribed “Wakan Tanka Ohala Po,” (wah-kan tonka oh-ha-la poe) which means “Praise ye the Lord.” These three items are still in the chapel today. In 1884 the Oahe Industrial School, a boarding school, opened and operated until 1914. Thomas’ second wife, Margaret “Louisa” Irvine Riggs, was the superintendent of the school. On weekdays, the chapel was still used for academics, with English the language of the home and school. However, most religious and moral instruction was given in Dakota. After the boarding school closed, the chapel continued to serve the local community of both whites and American Indians. One church service was held in Dakota and another in English. By 1931, services were conducted entirely in English. After Thomas died in 1940, Louisa continued to use the chapel for Sunday school classes until her death in 1951. In 1956, the Riggs’ sons, knowing the mission would soon be flooded by the Oahe reservoir, deeded the chapel to the State of South Dakota. It is the only building from the mission that was saved. The remaining buildings, along with the family cemetery where Nina, Thomas and Louisa were laid to rest, now lie under approximately 150 feet of water. The state assigned the restoration and preservation of the chapel to the South Dakota State Historical Society. In the fall of 1957, the chapel was moved to a temporary location. It was permanently placed on the present site at the east end of the Oahe Dam in 1964. The chapel was listed on the National Register of Historic Places in June 1980. 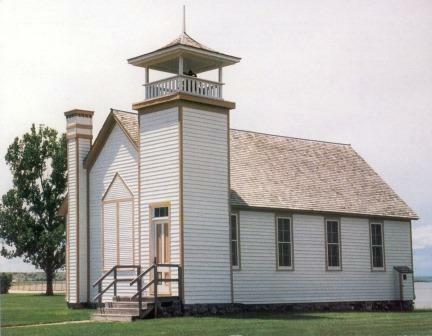 In 1984 the State Historical Society assisted with the formation of the Oahe Chapel Preservation Society. Comprised of local volunteers, the Preservation Society was formed for the care, maintenance, renovation, restoration and preservation of the Oahe Chapel for future generations. Restoration of the chapel began in 1986 and was completed in 1988. It was restored to its 1907 appearance, the earliest date for which interior photos were available. The chapel hosts ecumenical church services at 8 a.m. each Sunday from Memorial Day weekend through Labor Day weekend. It is often rented for weddings, baptisms and memorial services. The interior may be viewed by obtaining a key from the adjacent Visitor Center Monday through Friday from 9 a.m.-4 p.m. The Oahe Chapel Preservation Society does not receive state funding. Maintenance of the chapel is funded through annual memberships, rentals and donations. For more information on the Oahe Chapel, the Oahe Chapel Preservation Society or how to rent the chapel, contact the State Historical Society at 605-773-3458 or go online to history.sd.gov/Preservation/OaheChapel/OaheChapel.aspx.